CAIRO (AP) — Shaking off years of political apathy, Egyptians turned out in long lines at voting stations Monday in their nation's first parliamentary elections since Hosni Mubarak's ouster, a giant step toward what they hope will be a democracy after decades of dictatorship. The vote promises to be the fairest and cleanest election in Egypt in living memory, but it takes place amid sharp polarization among Egyptians and confusion over the nation's direction. On one level, the election is a competition between Islamic parties who want to take Egypt in a direction toward religious rule and more liberal groups that want a separation between religion and politics. The Muslim Brotherhood, Egypt's largest and best organized group, along with other Islamists are expected to do well in the vote. But also weighing heavily on voters' mind was whether this election will really set Egypt on a path of democracy after months of turmoil under the rule of the military, which took power after Mubarak's Feb. 11 fall. Only 10 days before the elections, major protests erupted demanding the generals step aside because of fears they will not allow real freedoms. 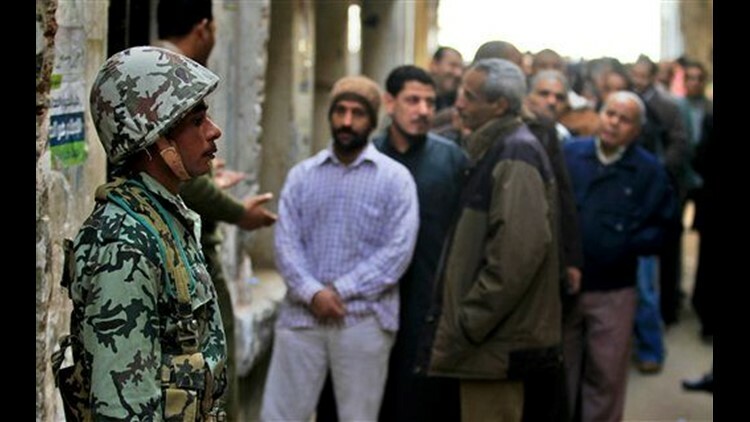 Early in the day, voters stood in lines stretching several hundred yards outside some polling centers in Cairo well before they opened at 8 a.m. local time (0600GMT), suggesting a respectable turnout. Many said they were voting for the first time, a sign of an enthusiasm that, in this election, one's vote mattered. For decades, few Egyptians bothered to cast ballots because nearly every election was rigged, whether by bribery, ballot box stuffing or intimidation by police at the polls. Turnout was often in the single digits. "I am voting for freedom. We lived in slavery. Now we want justice in freedom," said 50-year-old Iris Nawar at a polling station in Maadi, a Cairo suburb. "We are afraid of the Muslim Brotherhood. But we lived for 30 years under Mubarak, we will live with them, too," said Nawar, a first-time voter. Some voters brought their children along, saying they wanted them to learn how to exercise their rights in a democracy. Lines in cities around the country brought out a cross-section of the nation: men in Islamic beards, women in trendy clothes, the conservative headscarf or the niqab — the most radical Islamic attire covering women's body from head to toe with only the eyes showing. Many complained that the lines were too long and moved too slowly at the stations, which were heavily guarded by police and soldiers to prevent violence. "If you have waited for 30 years, can't you wait now for another hour?" an army officer yelled at hundreds of women restless over the wait at one center. The election is burdened with a long and unwieldy process. It stretched over multiple stages, with different provinces taking their turn to vote with each round. Each round lasts two days. Voting for 498-seat People's Assembly, parliament's lower chamber, will last until January, then elections for the 390-member upper house will drag on until March. Moreover, there are significant questions over how relevant the new parliament will even be. The ruling military council of generals, led by Field Marshal Hussein Tantawi, insists it will maintain considerable powers after the election. It will put together the government and is trying to keep extensive control over the creation of an assembly to write a new constitution, a task that originally was seen as mainly in the parliament's hands. The protesters who took to Cairo's Tahrir Square and other cities since Nov. 19 in rallies recalling the 18-day uprising that ousted Mubarak demand the generals surrender power immediately to a civilian government. Some hoped their vote would help eventually push the generals out. "We are fed up with the military," said Salah Radwan, waiting outside a polling center in Cairo's middle-class Abdeen neighborhood. "They should go to protect our borders and leave us to rule ourselves. Even if we don't get it right this time, we will get it right next time." On Monday morning in Tahrir, a relatively small crowd of a few thousand remained to keep the round-the-clock protests going. Clashes during the protests left more than 40 dead have heightened fears of violence at polling stations. By early afternoon Monday, there were no reports of foul play or violence except in the town of el-Badari in the southern Assiut province when armed men fired at polling centers and prevented voters from reaching them because the name of the candidate they support was not on the ballot. There were no reports of casualties. For some, the central question in the vote was whether Egypt will go on a more Islamic or secular path. The Brotherhood entered the campaign armed with a powerful network of activists around the country and years of experience in political activity, even though it was banned under Mubarak's regime. That gave them what many see as a significant advantage over liberal, leftist and secular parties, most of which are newly created since Mubarak's ouster, are not widely known among the public and were plagued by divisions through the past months. In the Mediterranean coastal city of Alexandria, thousands of voters braved rain and strong winds to go to the polls. Long lines formed outside polling centers, with voters huddling under umbrellas. At one polling center in the Raml neighborhood, around a half dozen army soldiers stood guard by the ballot boxes inside. "Choose freely, choose whomever you want to vote for," said one soldier, using a microphone. Alexandria is a stronghold of the Brotherhood and many voters said they would vote for the group. "The Muslim Brotherhood are the people who have stood by us when times were difficult," said Ragya el-Said, a 47-year-old lawyer. "We have a lot of confidence in them." The Brotherhood is facing competition on the religious vote, however, particularly from the even more conservative Salafi movement, which advocates a hard-line Saudi Arabian-style interpretation of Islam. While the Brotherhood shows at times a willingness to play politics and compromise in its ideology, many Salafis make no bones about saying democracy must take a back seat to Islamic law. "We're scared of the way they talk or that they'll limit our freedom or keep us from building churches," Christian voter Imad Zakhari said about the Islamists. "We had a revolution so we could have more freedom, not less," he said while waiting in line to vote with his 10-year-old son, George, standing next to him. "I don't know any of the parties or who I'm voting for," she said. "I'll vote for the first names I see I guess," said Teresa Sobhi, a Christian voter in the southern city of Assiut. Still, she said, "there may be hope for Egypt at last, to build it from scratch." The region is a bastion of Islamists, but also has a significant Christian population. Across the city in the Walidiya district, teenager Ahmed Gamal was handing flyers urging voters to support the Nour Party of the Salafis. "We used to be arrested by police under Mubarak for just going to the mosque. Our Nour party will now implement Islamic laws," he enthused as he handed the flyers to voters waiting in line — a violation of rules barring campaigning at polling centers. Back in Cairo, Shahira Ahmed, 45, was in line with her husband and daughter along with some 500 voters outside a polling station in a school in the upscale neighborhood of Zamalek. She said she was hoping liberals can at least establish some presence in parliament — "to have a liberal and a civilized country, I mean no fanatics." And, like many, she was still not sure whether democracy was really on the horizon. "I never voted because I was never sure it was for real. This time, I hope it is, but I am not positive." Monday's vote was taking place in nine provinces whose residents account for 24 million of Egypt's estimated 85 million people. Most prominent of the nine provinces are Cairo and Alexandria, Egypt's second largest city. Turnout among the estimated 50 million voters will play a key role. A higher turnout could water down the showing of the Brotherhood, since its core of supporters are the most likely to vote. Heavy numbers of voters will also give legitimacy to a vote that the military insisted go ahead despite the past weeks' turmoil. A referendum in March had a turnout of 40 percent — anything lower than that could be a sign that skepticism over the process is high. The Brotherhood, which used to run its candidates as independents because of the official ban on the group, made its strongest showing in elections in 2005, when it won 20 percent of parliament's seats. Its leaders have predicted that in this vote it could win up to 40 or 50 percent. AP correspondents Maggie Michael in Cairo, Hadeel al-Shalchi in Alexandria, Egypt, and Aya Batrawy in Assiut, Egypt contributed to this report.